Earlier this week I had a friend visiting from out of town. He was en route back to the States after nearly 6 months cooped up on a base in Kabul. I wanted to show him as much of Mongolia as I could over the course of his very short stay, so I took him up to Darkhan (pronounced Dar-han). Darkhan is a city of about 75,000 and only a 3 hour drive from Ulaanbaatar. The city is an urban planning experiment, built just 51 years ago in 1961 with the help of the Soviet Union. While we were there for less than 24 hours, I was able to get a little bit of a feel for Darkhan. It’s much more laid back than bustling UB. It also seemed a lot cleaner and had fewer of UB’s urban problems of crime and violence. From the moment we arrived, we were taken under the wing of the sister of a friend of mine from UB. 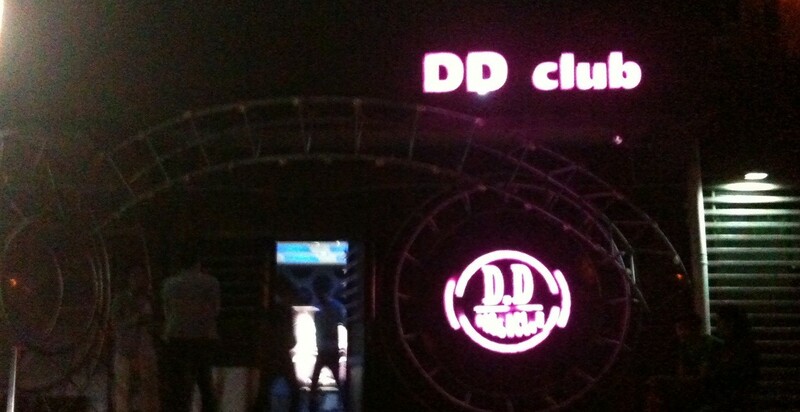 She, along with a friend of hers, took us out to dinner and then gave us an option: karaoke or night club. It was Monday, mind you, so I was leaning toward karaoke. But like so many ‘choices’ I’m given here, it was an illusion. So, after a nighttime stroll around Darkhan’s lovely central park (I’m told there are excellent fountains during the summer), we headed to DD Club. If DD Club isn’t the best that Darkhan has to offer, it has to be up there. Like all great bars, you have to descend a staircase to enter. It’s decorated like some sort of tricked out cave. The stucco walls have strategically placed holes that make them feel like organic rock formations. The tables are made of frosted glass and glow blue or red. But the highlight is definitely the dance floor. The floor is made entirely of glass blocks and raised 2 feet above the ground so you can see the rubble beneath your feet as you get down. It’s lit with a neon green, adding to the cave-like feel. The DJ spins (that’s generous) on a stage in front of a large screen fully equipped with trippy videos, lasers, and the obligatory fog machine. The dancing was actually quite organized. The DJ would play fast songs (mostly Euro-pop) for about 30-45 minutes. Everyone would pile onto the floor. Then he would switch to slow jams and everyone would return to their tables (most of which sported a bottle of vodka). Then the fast songs would start, and the cycle would continue. At one point, I noticed the alternating words on the screen behind the DJ said ‘Hey Guys’, then ‘Freedom’, then ‘Free Dance’. I tried to capture the splendor of DD Club on my iPhone, but after only ten seconds, the girls we were with vehemently told me to turn it off.